A dish that is on the prominent position of my must-eat list (when I am on vacation) is sate kelapa (or in its local variant known as sate kelopo). This is like the usual satay, except that it is sprinkled with coconut rasp (hence the name, kelapa is coconut) before being grilled, thus giving its distinctive, wonderful and appetizing smell. 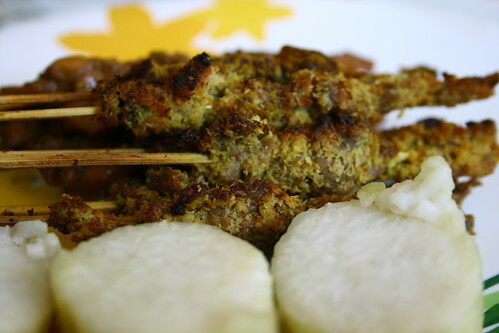 You can find sate kelapa if you travel around Surabaya and perhaps other places in East Java. A portion of 10 pieces typically costs only 50 Eurocents. Served with lontong (bite-size compressed rice), with peanut-mixed-with-soy-bean sauce, you would never stop eating it. There was a time I had a double portion for breakfast, every single day in a week! Warung Sate Klopo itu di Surabaya ada di Jalan Walikota Mustajab (Ondomohen), malam hari dia buka. yes,correct, the location at Jl. Walikota Mustajab in Surabaya City. I must protest the heavy corporate bias in this post!